The provisional statement on the status of the global climate in 2016 has been released early this year to help inform negotiators meeting in Morocco, who are trying to push forward with the Paris Climate Agreement. The document says the year to September was 0.88 above the average for the period between 1961-90, which the WMO uses at its baseline. The whole of 2015, which broke the previous record by a significant amount, was 0.77 above the 1961-90 average. While there are still a couple of months to go this year, a preliminary analysis of the October data indicates that 2016 is very much on track to surpass the 2015 level, which in turn broke the previous high mark set in 2014. "Another year. Another record. 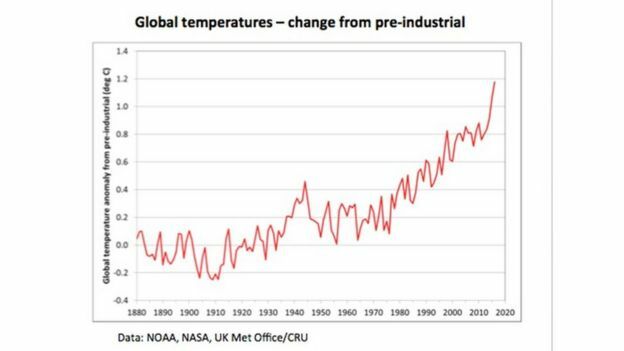 The high temperatures we saw in 2015 are set to be beaten in 2016," said WMO secretary-general Petteri Taalas. "In parts of Arctic Russia, temperatures were 6C to 7C above the long-term average. Many other Arctic and sub-Arctic regions in Russia, Alaska and north-west Canada were at least 3C above average. We are used to measuring temperature records in fractions of a degree, and so this is different," said Mr Taalas. The report highlights the fact that other long-term climate change indicators are also breaking records. The amount of greenhouse gas in the atmosphere continued on its upward march in 2016. Arctic sea ice continued to melt in significant amounts, while the Greenland ice sheet displayed very early melting this year. Experts believe that the El Nino weather phenomenon played a role in the record warm temperatures seen in 2015 and 2016. They quantify it as roughly 0.2 of a degree - but the bulk of the warming is coming from the accumulation of greenhouse gases. And the impacts of that warming are being widely felt. "Because of climate change, the occurrence and impact of extreme events has risen," said Petteri Taalas. "'Once in a generation' heatwaves and flooding are becoming more regular. Sea level rise has increased exposure to storm surges associated with tropical cyclones," he said. The surprise election of Donald Trump as president of the US has increased expectations that he will bring a more sceptical view of climate change to the White House. Scientists are stressing that the evidence for the reality of climate change is getting stronger all the time. "We are seeing the impacts of climate change on extreme weather," said Dr Peter Stott, who leads the climate attribution team at the UK Met Office. "One degree may sound a relatively small number but in the context of such a stable climate that we've had over the past millennia, and the rapidity of that warming, we are seeing this real world evidence that doesn't come from a model or a projection." According to the WMO analysis, 16 of the 17 warmest years have been recorded this century. The only exception was 1998.